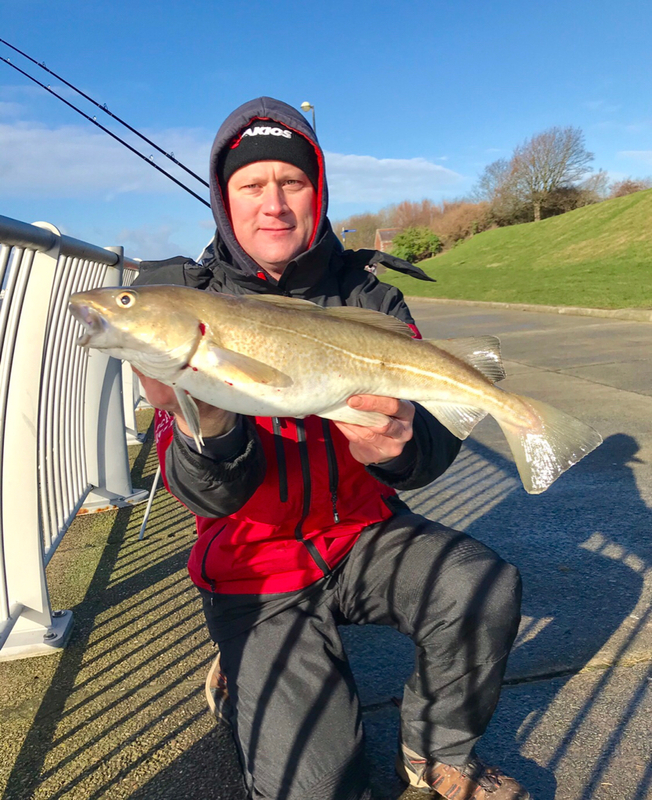 Gaz, Mark and I had a dabble down at Otterspool today for what may be our last coddo session before we turn our attention to the conger, huss and rays on the island. Gaz and I arrived at low water to catch the start of the tide. Mark had had a few too many last night and was due to join us a little later. We got set up and it wasn’t long before it started. “Are there fish in there?”. “What are you fishing for?”. “Rex, c’mere boy, stop eating that mans bait!”. Don’t you just love prom fishing! Anyhow, first chuck and in came a codlet. It was a start but we hoped that we weren’t going to be plagued by the smaller fish. As it happened we didn’t. We simply didn’t get plagued by anything other than the odd crab! The wind picked up considerably and temperatures dropped making conditions a tad uncomfortable. Our enthusiasm was fading. And then it happened. No not a fish, Mark turned up, complete with coffee and a Mackys breckie bap! We were happy again! As we chatted and warmed our hands on our coffee cups I noticed my rod bouncing and as I walked over I could see my line had travelled way up river. Before long a nice coddo of 3lb 15 came over the railings. I spent the next 10 mins answering the usual questions. “Did you catch that here?”. “Is that a cod?”. “Hope you have plenty of potatoes for that!”. In a carrier bag and hidden away it went. Regrettably we didn’t have further inquisitive questions to answer as nothing else came out! Zilch, nothing, absolutely buggerall! As high water approached we called it a day. It’s been a poor winter on the river but it was pleasing to sign off with a half decent coddo. Good stuff.Looks a nice clean fish Graham. Nice fish Gra laaaaaaaaaaaaaaa....you`re right about this winter,same as last year fooookin sheeeet. May not be your last Graham after bagging that one. Willpower wrote: May not be your last Graham after bagging that one. To be perfectly honest I was lucky to bag that one. I’ve heard of very few half decent fish coming out this year and more blanks reported than I care to remember. I think I may do a flounder session somewhere soon. It’ll be a refreshing change to see the rod tips rattling! I think I'm having all your blanks Graham ! Last edited by Twotides on Tue Feb 12, 2019 4:32 pm, edited 1 time in total.